Sarah Kliff—who really should be working the fiscal cliff beat, no?—highlights an interesting survey result today. 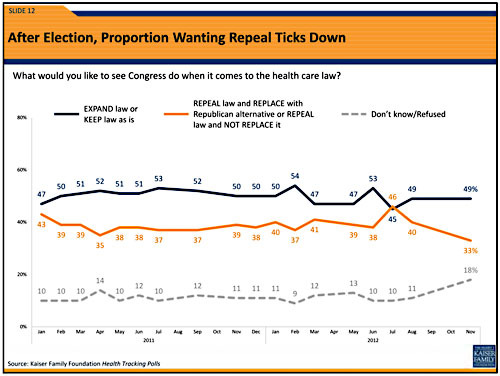 In its latest healthcare tracking poll, the Kaiser Family Foundation finds that 49 percent of the public wants to keep or expand Obamacare, while 33 percent want to repeal it. This is down considerably from August (the most recent previous poll), when 40 percent of the public wanted to repeal Obamacare. Likewise, overall unfavorability ratings are also down, from 43 percent to 39 percent. As the chart below shows, this mostly happened all at once. The sentiment for repeal stayed pretty steady at around 40 percent for two solid years, and then suddenly dropped right after the election. The mere fact that Obama won, and therefore Obamacare was here to stay, apparently changed a lot of minds. Elections really do have consequences.